Build capacity for developing policy and designing incentives for sustainable resource utilization and conservation through training and analysis on land-use economics and use of economic instruments, land-use policies, and sustainable business plans. Build capacity closest to where it is needed, and that stays close to where it is needed by equipping local scientists, researchers, and the community of changemakers/policy makers with key knowledge in economics that will enable them to conduct better policy analysis as well as design and implement policies more effectively. Provide real on-the-ground learning experiences for the course graduates to directly contribute to strategic forestry and land use management and policy issues at their locality/kabupaten (district) through policy research that is locally relevant. 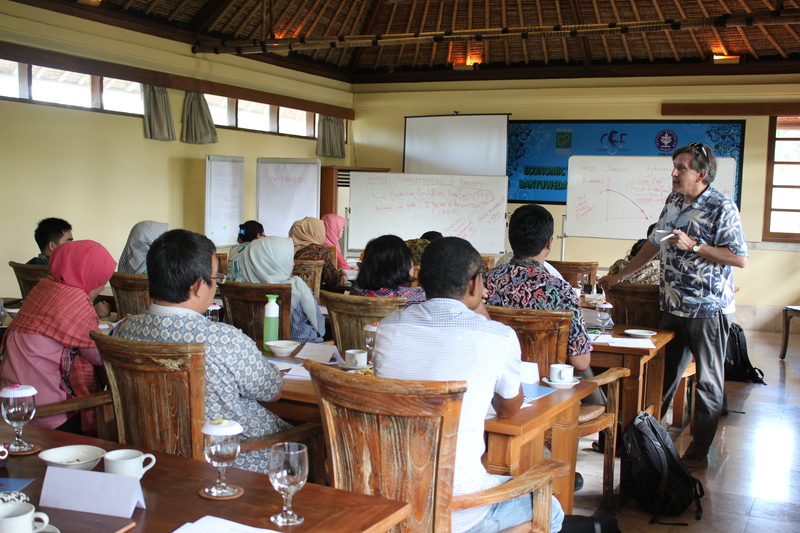 A one-week customized training course focused on the policy, economics and governance of land use in the context of Indonesia and Central Kalimantan Province. Participants were selected from the community of changemakers at the sub-national level including leaders from civil society organizations and progressive businesses, academics, and representatives of key government institutions in development planning, forestry and land use management. Local wisdom of the Dayak tribe in practicing sustainable development in Kabupaten Kotawaringin Barat: A socio-economic study. Analysis on oil palm plantations’ contribution to local revenue in Kabupaten Kotawaringin Timur. Analysis on collaborative management between local government, communities, and the business sector for sustainable livelihoods in Kabupaten Gunung Mas. Uncontrolled land use change as a major driver of forest fire in Kabupaten Pulang Pisau. Improving local livelihoods through better policy on the rattan industry in Kabupaten Katingan. Analysis on the potential of banana as an alternative commodity to increase local revenue in Kabupaten Seruyan. Mentorship for the research projects was provided by Yusurum Jagau (professor in the Faculty of Agriculture, Palangka Raya University, Central Kalimantan), Hendrik Segah (environmental economics professor in the Faculty of Forestry, Palangka Raya University), Azis Khan (forest conservation expert) and C. Desta Pratama (CSF Program Manager). Final research reports were disseminated at the kabupaten level in August 2018 and the provincial level in September 2018. Policy briefs from the studies were submitted to and accepted by the Head of Bappeda of Central Kalimantan Province, with the promise to include these recommendations in the upcoming revision of Medium Term Development Plan (RPJMD) and any upcoming landscape and spatial planning documents at the provincial level. The program was made possible through support from the David and Lucile Packard Foundation.